After we’ve carved the pumpkins, eaten the turkey and survived Black Friday, it’s time to sit back, eat fudge and watch our favorite holiday movies on Netflix. This year, our choices include classic holiday films as well as some original Netflix movies. Many are comedies and some are tales of romance, but each one has a positive message about love and family. And who doesn’t need a bit of positivity right about now? Kelly Clarkson makes a surprise visit when the Boovs, a family of aliens, celebrate their very first holiday season. This animated film is an intergalactic take on the best and worst holiday traditions. Christmas Eve doesn’t go exactly as expected when a man ends up ends up barricaded in a liquor store with five other strangers in El Camino, Nevada. This holiday comedy stars Dax Shepard, Jessica Alba and Vincent D’Onofrio. An interior designer (Brély Evans) sets out to decorate the Chesterton Hotel for the holidays when she begins to fall for the hotel owner’s handsome grandson, Edmund James (Andra Fuller), and uncovers a secret plan that will destroy the hotel’s legacy. Tim Allen plays a man who accidentally kills Santa on Christmas Eve, only to find out that a clause in a contract means he must take Santa’s place. 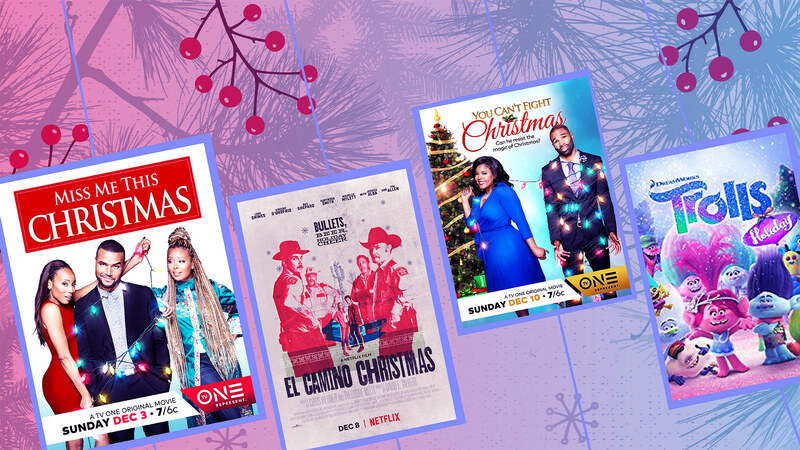 This is the story about a perfect couple (Erica Ash and Redaric Williams) who celebrated a fairytale Christmas wedding three years ago but now find their marriage on the rocks. Could divorce really be the holiday gift this husband and wife are giving each other? If your family celebrates Hanukkah, you might want to stream this Steven Spielberg animated gem about a Russian mouse named Fievel who immigrates to America and must navigate a strange new culture. This Dr. Seuss tale is a staple for Christmastime. Jim Carrey makes a perfectly despicable Grinch, who tries to steal the holiday from the residents of Whoville. It’s just not Christmas without this Oscar-nominated animated film. Jack Skellington (Danny Elfman), the king of Halloween Town, discovers Christmas Town, but his attempts to bring Christmas to his home cause confusion. This Netflix original from 2016 stars Paul Reubens and Joe Manganiello. Pee-wee Herman has a fateful meeting with a mysterious stranger that ends up inspiring him to take his first-ever holiday in this epic story of friendship and destiny. Bing Crosby and Danny Kaye play a successful song-and-dance team who become romantically involved with a sister act (Rosemary Clooney and Vera-Ellen). Together, they team up to save the failing Vermont inn of their former commanding general. What movies will your family stream this holiday? Let us know in the comments.